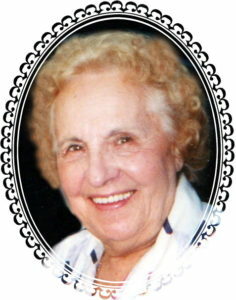 Rose (Danza) Vento, passed away peacefully surrounded by her loving family on Thursday at Seaview Nursing Home at the age of 98. Born in New York, NY, she was the daughter to James and Theresa Danza. Rose married Nicholas Vento on June 16, 1943 and after 66 years of marriage he sadly passed in 2009. She had a passion for her family especially her husband, children, grandchildren and her great grandchildren. Rose is predeceased by her brother, Pat Danza and her sisters, Julia Rainero and Dolores Brown. She is survived by her daughter, Arleen Langere, a son, Robert Vento and daughter-in-law, Rosemary. Five grandchildren, Dawn, Tracey, Nicole, Jaime and Kristen. Also, eight great grandchildren. Funeral at Cherubini McInerney Funeral Home on Saturday at 10:15am with a mass at St. Ann’s R.C. Church, 11:00am, followed by a burial at St. Mary’s Cemetery. Family and friends are invite to view on Friday from 4pm-8pm. To the family of Rose V. Vento. We are never prepared for the loss of our love ones.